The Spicy Merlot Bon Bon starts with a delicate 38% milk chocolate shell that is filled with a smooth, velvety milk chocolate ganache infused with merlot, cinnamon, orange, with a touch of black peppercorn on the finish. The Cabernet Caramel is enveloped in a 58% dark chocolate shell. Inside you’ll taste a touch of wine and smooth caramel, with an interesting hint of salt on the finish. So I apparently am not the only one diggin’ on the Cabernet Caramels and not just because of the hint of vino—the caramel is so soft and gooey it is almost like the caramel sauce traditionally used on ice cream (but less sweet). The Wine Collection makes a gorgeous and classy gift for under $40—it comes in a limited edition wine bottle bag that can be reused for storage. In the spirit of the holidays, the 2 Chicks Team has decided to giveaway a box of their Signature Collection (pictured below) to one lucky reader. Contest ends Dec 23, 2009 at 5pm EST. Winner will be announced on the financefoodie.com site shortly afterwards. *For those of you who cannot wait and are just dying to try these sweet treats out or ecstatic to give them as a ready-wrapped-up-in-a-bag gift: 2 Chicks are offering a 20% discount to financefoodie.com followers. Just use the code FFOODIE at checkout! when isn't it a good time to eat CHOCOLATE. Hubby and I figure that chocolate is something that must be eaten at some point everyday. Chocolate is always applied in stressful situations! Applying with wine is always helpful as well. I like to eat chocolate when I read a book. I like to eat chocolate when I have PMS and need something comforting! Is there a BAD time to eat chocolate? I like eating anytime but especially while I'm reading. I don't eat chocolate, but my boyfriend has some almost every evening! I love to eat chocolate immediately after a meal. I just have to have that sweet after I eat. I like to eat it right before bed. Thanks for the chance. I love quality chocolate - and unlike my husband and daughter, I savor it and stretch it out to make it last. I think I must be a chocolate snob now, but the good stuff is soooo worth it. I like to eat a piece or two in the evening. Anytime or place I can get My hands on chocolate-I eat it. i like to hide bags of hersheys baking kisses in different cabinets and in the freezer and act "surprised" when i find them and "treat" myself! I love to eat chocolate ALL THE TIME!! I atleast have some form or fashion everyday. I have to walk everyday to keep up my chocolate habit! I followed financefoodie1 on twitter. I am following 2Chixwchocolate on twitter. Anytime is a good time for chocolate! 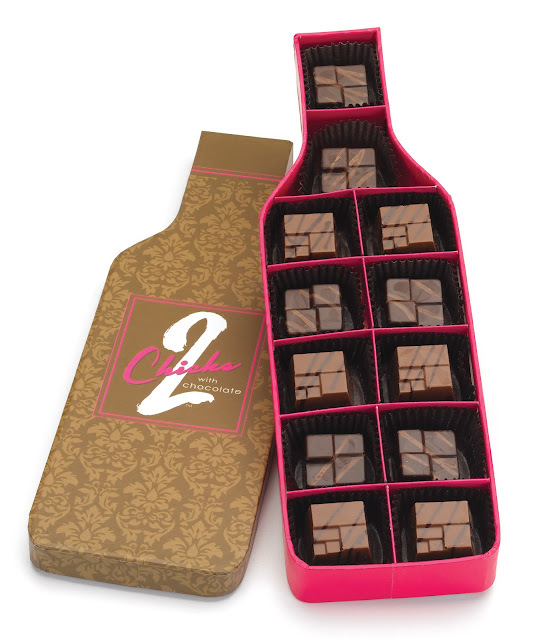 I like to eat chocolate as an afternoon pick-me-up, but I would never refuse it! Thanks for the chance. There is no special occasion for me. I love to eat it all the time. I LOVE to eat chocolate all the time :) *Thanks* for the giveaway! I like to eat chocolate just about anytime, but I like it even more when it's a cold day and I'm curled up on the couch with a mug of tea. I find myself eating chocolate most often around that time of the month. LOL. I love chocolate all the time, but it really appeals to me then. Following 2Chixx on twitter @getalonghome. I like to eat chocolate any time of the day. I guess especially after dinner or late at night. I like to eat fine chocolate while sipping a great red wine, while soaking in a fragrant bubble-bath! Thanks! At the end of a long day at daycare, I find myself craving a piece of chocolate. It's a snack that is just for me. I like chocolate ANYTIME, but especially with a glass of milk. I love eating chocolate day in and day out! I like a little chocolate after a spicy meal for some reason. I like to eat chocolate all the time. But it's a private act. I eat chocolate when I'm alone and depressed, or alone and giving myself a treat. It soothes and comforts. I can eat chocolate anytime but I especially like to have some when I'm feeling down. I'd eat chocolate everyday if I could..I usually eat it on Christmas,Valentines Day and Easter..
ANY time is chocolate time in my house! I like to eat chocolate when I am watching TV. I like to eat chocolate during lunch time. I love to eat chocolate anytime I get the craving...Well I'm honest!! I think anytime is a good time for chocolate! It's a daily indulgence for me (in small doses). I like to eat chocolate when I'm stressed! I like to eat chocolate when I need a subtle pick me up. The sugar helps give me a little bit of energy- its great while studying! WHEN do I like to eat chocolate? is there EVER a time I DON'T want to eat it? Chocolate is especially good when you are feeling low. It perks you up right away. I'M READY!! I love Chocolate anytime anyplace - it always makes me feel better. I like to eat chocolate just about anytime! I love to eat chocolate everyday! Chocolate for me is great anytime. But my favorite time to eat chocolate is for dessert after dinner. I am following Two Chicks With Chocolate via Twitter as jlsc123. I like to eat chocolate when I have a stress filled day which is just about all the time. Please enter me. I like to eat chocolate right before I run on the treadmill! I like to eat chocolate everyday, but I limit myself to on small piece most days. I love to eat chocolate anytime but I do like to have my sweet snack at nite after dinner. I love chocolate and I like to eat it almost every day, several times a day. My favorite time is when I'm stressed and I just need a moment to say "ahhhh," and I sneak a piece and enjoy. I love chocolate anytime, but I've never had any chocolate so gourmet as this. Would love to try some. I love to eat chocolate after dinner! Is that a trick question? Of course all the time! Already follow you on Twitter. My username is the same. I like to enjoy chocolate when I need a little pick me up! I like to eat chocolate all the time, anytime, and on any occasion. You hit it right when you said "all the time". It may be five o'clock somewhere but it's always time for chocolate! I eat chocolate all the time. I'm a chocoholic. Chocolate time is 24/7. Chocolate make the spirits soar and tastes so good. IS there a time not to like chocolate??? I like to eat it on occasion, and I sure enjoy it when I do. I always love to eat chocolate. Especially now that they say it is good for you. I love to eat chocolate, I eat it anytime I have a craving for it, thanks! I wish I could eat it everyday, but since I'm watching my girlish figure I try to eat every now and again for a treat! I could probably eat chocolate at any time although I especially like to savor it while relaxing and having a bit of private time with a book and a cup of tea. Thanks for the giveaway. I like to eat it any time, especially dark chocolate, and I like it with cheese, raisins, nuts, grapes, & apples & caramel. I love to eat chocolate all the time but lately I've been trying to eat dark chocolate and chocolate with healthy properties to it. Dark chocolate particularly helps with my migraines! Oh num. I still prefer to have a glass of wine with my chocolate, but I sure wouldn't mind trying the two in one package! I like to eat chocolate all the time but I admit when I have PMS I use it as a justification to NEED chocolate! I eat chocolate all the time. Thanks! I follow 2Chixwchocolate on twitter. I follow financefoodie1 on twitter. I like to eat chocolate when guests are here so that we can share the experience. Did you ever do a chocolate tasting? Those are really fun. I like to eat chocoate when I'm watching tv or right after a meal but really it's fabulous all the time for sure! It's always a good time for chocolate-I eat it when I'm happy, when I'm stressed or blue---I think I have probably had chocolate every day of my adult life--it's kind of a "religion" with me--thanks for the chance to win! All the time, as much as possible!! I must admit I love to eat chocolate anytime !! I am such a chocoaholic. There is no right or wrong time for chocolate. Chocolate is a must have whenever the mood hits you. I like to eat chocolate any time. I'll eat chocolate at any time but I especially love it as a dessert after dinner. I eat it morning, noon and night, but mostly when my aunt's visiting. i love to eat chocolate pretty much always! and especially now since i am pregnant! I like chocolate whenever I get the cravings for it, usually a couple times a week. When I've been really good eating healthy food, I like to reward myself with chocolate every now and then. My hubby and I have real problems with chocolate-we are chocoholics and MUST have it every day! I follow Finance Foodie on Twitter~dresdenrain. Follow 2 Chicks with Chocolate on Twitter ~ dresdenrain. I like to eat chocolate in the day time! Okay, night time also! I love to eat chocolate as a special sweet treat at the end of my meal. I like to eat chocolate when I am tired. It just tastes so good then. i follow 2 Chicks with Chocolate on twitter - js22222222 . I love to eat chocolates on the weekend when I am home relaxing with a good book.